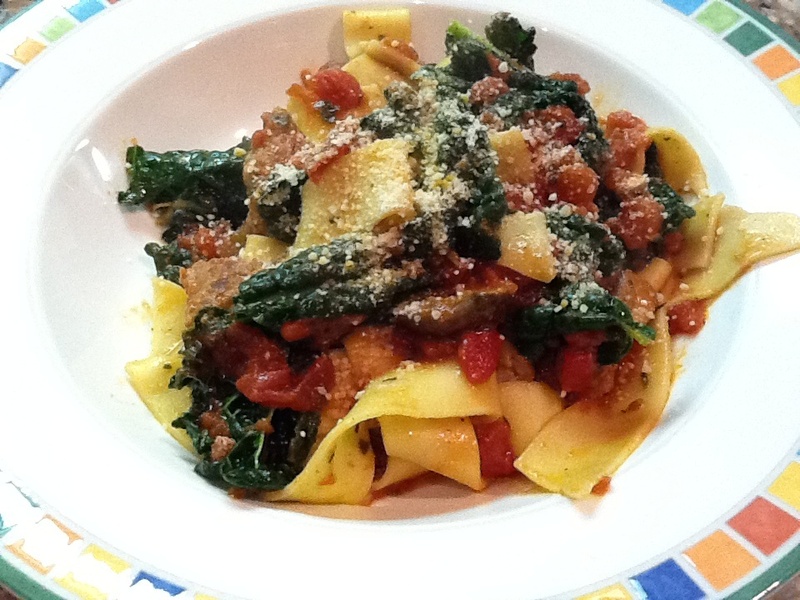 Bolognese sauce is a yummy and healthy alternative to basic marinara sauce. It's like a kicked up marinara filled with meat and veggies. This sauce is full of iron, calcium, folate, fiber, protein, vitamins A, C, D, and potassium, and the pasta is full whole grains. This is a meal your whole family can enjoy from 8+ months. You can puree it or cut it up into bite size pieces for little ones eating finger foods. Open up sausage casings and scoop meat into a large deep skillet over medium high heat. While sausage is cooking, bring a pot of salted water to boil. Add pasta and cook according to package. Remove 1/3 cup pasta water and set aside, and then drain rest. When sausage is browned add garlic and mushrooms. Saute for 2 to 3 minutes and then add diced tomatoes, chopped kale, Italian seasoning, nutmeg, and parmesan cheese. Cover and let simmer for 5 or so minutes. Add cooked pasta and pasta water to large skillet and toss to coat. Season with a little salt and pepper if needed. If you are pureeing, wait until cooled and then puree with a little water. Serve and enjoy! This looks yummy, but how do you figure that the pasta is "full whole grains"? I only use whole wheat pasta, which is made with and retains whole grains, so yes this pasta is full of whole grain.